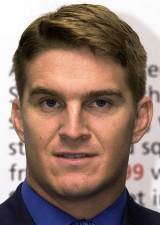 Horan won 80 caps for Australia, scoring 30 tries, in a glittering 11-year career that included two Rugby World Cup victories in 1991 and 1999. He formed memorable partnerships with Jason Little and latterly Daniel Herbert and with his superb all-round game carved out a reputation as one of the greatest centres to have played the game. He made his international debut against New Zealand in 1989 and would go on to make his Rugby World Cup bow in 1991 where he scored four tries as the Wallabies secured the game's biggest prize for the first time. He battled back from a career-threatening knee injury in 1994 that sidelined him for a year to make his second Rugby World Cup appearance in 1995. But it was at the 1999 event that he arguably reached his peak, scoring two tries including the fastest in the tournament - after just 92 seconds - in the opening game against Romania. His stand-out performances saw him named the Player of the Tournament. He captained his country for the first time in 1996 and made his final appearance in the Green and Gold in 2000 against Argentina in Brisbane. He played his Super Rugby for the Queensland Reds and brought the curtain down on his domestic career with Saracens in England. In 2009 he was made a Member of the Order of Australia and was named as a Classic Wallabies Statesman by the Australian Rugby Union.